P.S. 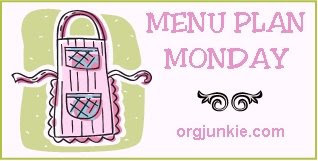 : Check out more meal planning ideas at Org Junkie's Menu Plan Monday! I've got to try that foil packet chicken! Hey Lindsay! Thanks for sharing these each week, I'm excited to try the foil pack chicken! PS I still read your blog everyday and am obsessed so thanks for keeping up the good work!